Finer details make a difference. For example, I didn't know that my sister and I were mentioned in the cloud next to the rainbow. Or that his partner's name is stitched on the flag at the top of the sailboat. 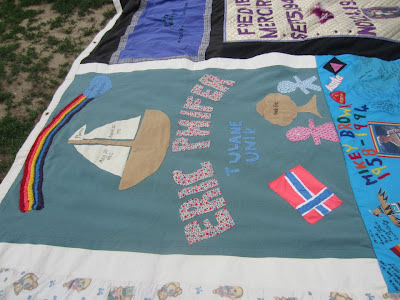 Or that the tree had *Uncle Eric* stitched on it. He was close to his partner's niece and nephew, but he was also very proud of being a proper uncle to my son. He died before I became pregant with my daughter or indeed before my sister married, but he would have adored all his nieces and nephews. It is the finer detail that makes the quilt. My brother would not have necessarily approved of the fabric choice but he would have approved of the sentiment and in the end, the sentiment is the most important thing. The same is true for writing. It is the little details that bring a story to life. It helps to create the awe moment. Or the little bit that you remember. Or the bit that brings a character to life. My editor had given me her thoughts on my latest Viking. Some work needs to be done, but I needed her eye to see it. She is right in her assessment and it goes straight to the finer detail. Now comes the hard part -- the writing of the full. But I need to remember the detail makes it. A recent find in an Austrian castle is aparently set to rewrite fashion history. Basically they have discovered two bras and a couple of pairs of skimpy string briefs which date from pre 1480 when the castle was extended. Prior to this the earliest date for a bra was the early 18th century, according to the article. However, if you know your Roman mosiacs, you will know about the bikini mosiacs in Sicily. Roman women were certainly wearing garments which were skimpy! It does make sense that women wore skimpy briefs, particularly at the TOM when they had a need for padding. less washing and less potential for mess. As fashion history did not become popular/a serious object for study until the mid 20th century (the main driver was the movie industry), and mostly intimate garments were tossed rather than preserved, it makes sense that we do have a huge gap in our knowledge. People would not be comfortable talking about the subject, particularly in eras when even a glimpse of an ankle was shocking, so why would they keep those types of garments? With bras, or over the shoulder suport, again it doesn't surprise me. Women are practical. I suspect over the centuries many different forms of suport were used. If you look at the history of undergarments in the late 19th century and early 20 th century (the sample size is large), the sort of undergarment required is dictated by the shape the woman wished to have. If you have a decollete with off the shoulder sleeves, you are going to need under the bust support, for example. The shape of the bust has changed as well. The pigeon breast of the 1890s and Edwardian age gave way to the flatness of the Flapper and eventually you get the pointed bras of the 1950s. You can see the shape women have today is dictated to a certain extent by spanx and other support clothing. The bra comes into its own with the advent of elastic. To make a correct fitting and comfortable bra without elastic is a highly technical job. Far easier to push them up sort of thing. But it is one of those things, we can only have an educated guess about what Viking women or medieval women wore under thier clothes. I also suspect that if I suddenly have my Viking heroines wearing bras and skimpy briefs all the time, readers will complain or be drawn out of the story. But it is something to be aware of certainly. I also discovered that Richard and Sophie are pencilled in for a April 13 release. The Viking which was accepted in January is being held until the 2nd half of 2013 because it makes more sense to release it after Richard and Sophie as I shall be doing Vikings here on out for Harlequin. My youngest's birthday present emitting a continual buzzing and occassional annoyed buzz is currently sitting in my study, wating for the rain to stop. They were in the hallway but I decided, there was less likelihood of accident if they were removed to my study. Accidents at this stage are devotedly to be avoided! A nucleus of Buckfast bees from Fragile planet.came via the post. The postman delivered them very gingerly and scurried off after he got my signature. He warned me NOT to open the package inside. As luck would have it, my youngest is off in the Lakes so it fall to me to get them settled in their new home. I suspect they have some feed. The Queen is currently caged but by the time I release them, the bees should have eaten through the candy to her. They need to sit with the entrance untaped for 24 hours (or so) next to the hive which will become thier home. Then provided tomorrow evening is dry, I can move the frames into the hive and feed them with a sugar syrup solution. All perfectly straight forward (provided the rain stops!). Right now though, I have a buzzing in my ears. I know they can't escape but the possibility is rather unnerving. The rain stopped. I carried the bees down to the bee garden, loosened the top of the box so I can get the frames out tomorrow evening. Unblocked the entrance and the bees poured out. Slightly unnerving so I was pleased I had my bee suit on. Still stage one is done. Tomrrow evening (provided it is dry) will be stage 2 -- moving the frames to the brood box, feeding and then closing up. My daughter left today for a four week stint at the Wastwater Youth Hostel as a volunteer. She has taken advantage of the YHA's student placement scheme. She gets valauble work experience plus room and board in one of the prettier YHA locations. She will be doing a wide variety of jobs (general skivvy I think but there is absolutely nothing wrong with that!) It will get her out of the house this summer. She learnt about the scheme through her university. The YHA run a wide variety of volunteering programmes. You can read about them here. Student placments tend to last 4 - 8 weeks, but shorter stints are available. I hope she has a great time and learns a lot about herself as well as what goes into making a venture like that a success. Today was the start of C1.2 L7 (day 242 of Meta) or the level affectionately known as shock and ow! Lots of twisting of hips. I can do the exercises but I was bathed in fairy dust. The plank at the end is easier in ways than the kick and rollup to a higher kick plank of the last level. You have to hand it to Tracy. She keeps coming up new ways to challenge your muscles. The twisting of the hips will be in part to loosen the hip flexors. Many people have tight hip flexors. This in turn leads to a sway back and a pooch for a stomach. Good posture can make you look far better than you might think. It puts less pressure on your lower back. Even just stretching your hip flexors can help with posture. I am hoping that that this level will really start attacking the remains of my love handles etc. Resculpting your body does take time and there are still lumps and bumps that I don't like. I know this is my persistently critical self talking but at least I feel like I am being proactive in combatting it. I am over at Cheryl St John's blog today to help her celebrate 7 years of blogging and 40 years of marriage! Cheryl is a fellow Historical author whose books I loved before I was published. She writes characters who entwined themselves about your heart strings. I am giving away a signed copy of His UNsuitable Viscountess to one person who comments on that blog as part of the celebrations. The grand prize winner of the HH Summer Beach bag giveaway has been drawn. Kathryn M. She has been notified and all the authors are hoping that she gets in touch soon because they want to send the grand prize out!